A member of The Collectors Weekly Hall of Fame, Paul Chenard shows off his impressive collection of race car toys and automobilia on his personal site, focusing mostly on European racing history. I’ve been collecting vintage toys since 1982. I started slowly and methodically, partly for lack of information, mostly for lack of finances. I used to collect any metal transportation toy that I found interesting, anything that caught my eye (and that I could afford). In the late 80s, a Canadian-made Chime tin wind-up racecar toy from about 1935 came into my collection and suddenly, I had to find more racecar toys. I slowly traded away my other toys to acquire more metal (tin and diecast) racecars. There has been an amazing diversity of new and old toys cars available. I’ve learned that in vintage toys, the German, French and British toys are the most coveted (diecast and wind-up tin). Japanese tin toys (tin, battery operated and wind-up) from the 50s, 60s and 70s are extremely collectible, with the battery-operated 50’s Atom Jet Racer selling for more than $3500 US. A note of caution: tin Chinese reproductions of the Japanese toys are colourful but have not much value to collectors. The French firm CIJ created a large stunning toy model of the famous late 1920’s Alfa Romeo P2 racer at approximately 1/10 scale. It comes in red, blue, white, green, yellow, and possibly even more colours. It copies the proportions and detail of the original perfectly, and even has functional steering. One of these in good condition can sell for easily $4000 to $5000 today; you can add $2000 to that if the box is included. If purchasing brand new toys for your collection, it’s good not to confuse toys with limited-edition collectibles. Toys are sold to be played with, while limited-edition collectibles are sold to be displayed. I have five-year-old Hot Wheels cars that have increased their value 20-fold; I don’t know of any collectibles that have that kind of return on their original purchase price. Always keep the packaging of your new toy; it can add up to 50 per cent to the value of the toy in the future. When you start collecting, take your time and learn as much as you can. Going to antique stores is a great way to start. You hold and inspect an antique toy without having to purchase it. Speaking to the more specialized dealers of antique toys may also get you some valuable information, and help them track down what you are looking for. The web, books, magazines and catalogues (new and used) are great sources of information, some general and others very specific in their focus. Some magazines publish an annual price guide, which is important when determining the value of your finds. 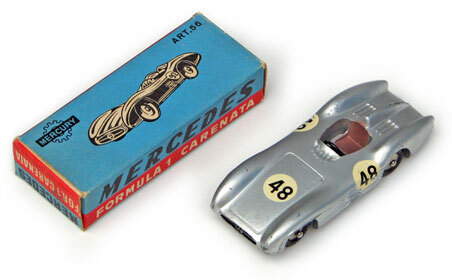 I have learned of the different toy cars produced by certain makers, and I have sought out their products. That is how I discovered the beautiful line of Mercury, Italy Grand Prix race cars and focused on acquiring some for as little as $50. Yard sales and flea markets can be good places to pick up something interesting. 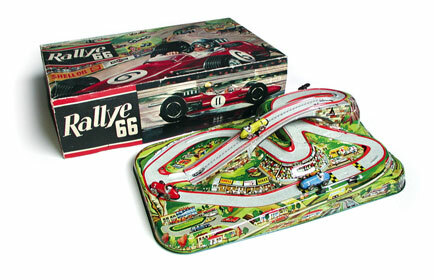 A mint and boxed Technofix tin wind-up Rallye 66 racetrack (now worth $300-$400) was originally purchased at a local flea market for $10.00. At auctions, there could be some toys in lots, but inspect them, make sure they’re in good condition and decide at the beginning how much you are willing to pay out. There are more and more Internet auction sites available; if you have studied the subject you are collecting well, and you are willing to wait for a reasonably priced collectible to come up, you can do really well in these auctions. I know I have. • If you can, pick a theme for your collection. It helps focus your research and your toy hunting. • Learn as much as you can before making your purchases. • Never pay more than you feel comfortable in paying out for an item. • Never acquire a broken toy, unless it’s free. My compliments to Mr.Chenard. The article on collecting and starting out to collect is very informative and well thought out. I started collecting Dinky Toys in 1966 and have had many great hunts and finds. I do use the common sense approach but have also acquired broken toys. Acquiring broken ones when I could not unearth good collectible ones often tips-the-scale and in my experience, the sought after item in collectible condition follows right after! Although, I have often bought or traded for two or three rough examples to combine into a play-worn collectible piece. Mr.Chenards’ tenants for collecting toys also can be applied to full size collectible automobiles. Very interesting page! I would like to point out that the Mercedes-Benz race car labeled “Chime Land Speed Racer, circa 1935, tin wind-up (Canada)” is actually a 1955 Type W196R 300 SLR streamliner. Keep collecting! Thanks for pointing this out … someone swapped the captions! I’ll point it out to them. I was in Italy a couple of weeks ago and bought an old mercedes benz tin car and have not been able to identify it. How can I find out what year it is? Please contact me at paul.chenard@hotmail.com with some photos of you toy. I have some pretty good reference material, so I will do my best to help you with some info. BTW, there is a feature on my collection in the current (December 08) Classic & Sports Car … yippee! Hi – i live in Miami FL and was wondering if you know of any places in south florida to purchase hot wheels collectables or events of the same nature. I’m not very connected to the collector-toy scene in Florida, but I would say going to local car shows and flee-markets is a good way to get connected. Checking your local Kajiji listing on the web might yield some nice surprises. I picked up some rare Dinky toy racers that way. It’s very important to know your subject though, and to decide what to go after. The longer you’re collecting, and studying Hot Wheels, the more focused you become. We have a mercedes bentz two seater battery powered steel toy car. We believe it was a give away back in the 60’s from yuban. We heard it was the first battery powered toy car. It is kind of like the power wheels. Hi – I collect many toys and my favorites are tin and pressed steel cars and trucks. I have several pieces that I am having trouble identifying. I many books and price guides, but none of them list my pieces. You mentioned that you have a good collection of research materail. Is there any of your books that stand out? I would gladly do a purchase and do my own research. I have a plastic showcase full of plastic cars. The back of the showcae reads: Ideal precision miniatures. The showcase is full of Cars, boats and ships. All of the cars appear to be in very good shape and the showcase just needs a little TLC. It’s very old. This was given to me when I was a young boy and I am now 47. When I got it, it was old then. If you could help me place a value or suggest where I may find help on it I would greatly appreciate any input. It’s very hard to reply to all your queries here, especially because I can’t see pics of the specific items you are inquiring about … I love everything about the hobby, and I will work very hard at getting the answers you’re looking for. Please email me directly with photos, and together, we’ll unravelled some mysteries … sound OK? Have a 1940 Ford pickup truck toy, excellent condition, heavy metal, model # 68062, scale 1:24, made in China. Just got at a garage sale. Is this a collectible with some value, or just a toy? Yes, I do know someone in Las Vegas who is a toy collector. Please email me directly at paul.chenard@hotmail.com and I will pass on your message. I am writing you from Belgium – Europe. I was happy to see your model of the Chime Record Car ! As this is the first time I see another one. I bought myself this model abouth 10 years ago, but untill today I didn’t now the maker, nor saw another one. So you can imagine my happyness. Do you have more detailed information on the model and the maker? “ ” The women who drew cartoons were nationally famous superstars. You can find scrapbooks with women's cartoons pasted in them, sometimes colored in by a young girl.